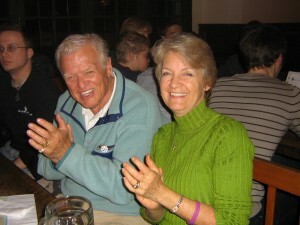 Here we are in Germany having a great time! But 6 months before that we were wondering if we were ever going to break loose of a stuckness. We planned, dreamed, talked about for over 2 years that we were going to go to back to Europe. (Jerry had been there 50 years earlier and me 30 years earlier). But Jerry ended up in the hospital with ecoli (serious case 3 weeks in the hospital) and then he had another health challenge dealing with altitude and his heart. I began to set our dream of traveling to Europe, let alone the rest of the world on the back, very back burner. LOVE………………EGO Once upon a time there was an island, where all the feelings lived together.One day there was storm in the sea and the island was about to get drowned. Every feeling was scared but Love made a boat to escape. Every feeling boarded the boat. one feeling was left. Love got down to see who it was..
Love tried and tried but ego wasn’t moving also the water was rising. Every one asked love to leave him and come in the boat, but love was made to love. At last all the feelings escape and Love dies with ego on the island..
Love Dies because of EGO. We have been doing our daily soul searching. For a week it has been on determining where our true “Niche” to help people might be. Here is the First GO Power Point from the Book! Interested in finding out how to change the challenges in your life experiences to happiness and improving health and wealth? This airplane story followed the one when he got the use of an airplane for almost NOTHING in one hour after deciding that is what his company needed. (the first airplane experience is posted on our website: www.EoutofEgo.com as an excerpt). Then it got taken away, and he didn’t get depressed, just decided that another one could show up just like the first one. Here is another one of Jerry’s sayings: If you miss the first streetcar (bus, plane, taxi, opportunity…) there is always another one coming! Looking forward to hearing from you all! Jerry & I went to a downtown restaurant with friends Virginia, Dan and Elisabeth to watch the inauguration this morning! Jerry got interviewed by a CBC local station, but we didn’t see if it got on the news!!! Fun though!I thought the inauguration speech was moving and I really am impressed that the leader is doing what we are talking about in our book – Less importance on the “E” and more on the job at hand. 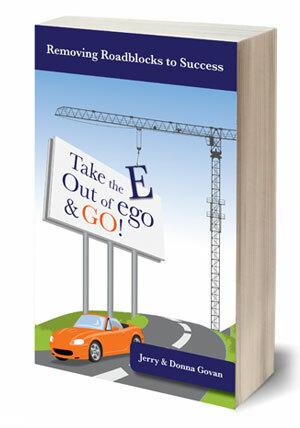 The style of leadership seems to be what Jerry has been sharing in the book – win-win actions and thinking. Notice in the very beginning of the speech, the President said – “I stand here, humbled by the task before us…” not before me. That to me is a good sign for effective leadership. OUR FIRST BOOK hit the press! Take the E out of ego and GO! Powerful Secrets to Prosperity, Relationships, Healing and FUN! We greet you now as published authors! and leave with a FREE UPlift! Of course we invite you to purchase a book by clicking on the buy now words above! Thanks for your support! We love you. Copyright 2008-2009. 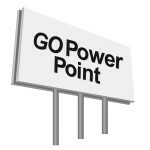 Go Power Publishing, LLC. All right reserved.